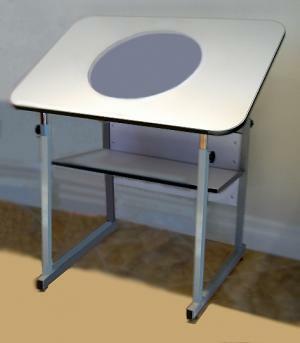 This sturdy, 4-post steel table is perfect for Animation Classrooms and Students that want the complete table with back light unit which is pre installed and ready to use. Small footprint and sits at the same height of a standard desk so you can use a classroom chair or roller chair. Very comfortable and very attractive while being durable enough for the classroom. For those who what to upgrade to a full size Pro Animation Disc, this table will also accept any Pro Disc in the industry. Animtion Full Table Pro comes complete with a 24" × 36" white Melamine® top that includes rounded corners for comfort and safety. It features sturdy one inch square steel tube construction and a durable powder-coated gray finish. Adjust the table height from 27" to 40" in horizontal position. Top will Adjust to angles from 0 to 30 degrees. Underneath the table is a built-in 9" × 24" storage shelf with back panel. Floor glides are adjustable for stability. Full Table Pro Animation Light table with duel color corrected (pure white light) bulbs for 30w florscent light which is equal to 150watts of incondescent light. Our custom light is attached to the top and moves up and down with the top for constant even lighting. Our light is self contained Stainless Steel box with (2) 15 watt color corrected bulbs attached to a single switch for bright white even lighting. It's built to save space and tough enough to provide years of service.